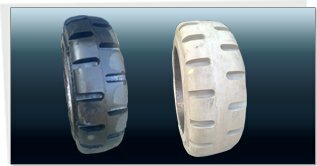 STERLING SOLID TYRES (P) LTD., promoted by a young group of technically very sound entrepreneurs, with a decade of Solid CushionTyres is a PROGRESSIVE Company. It's exclusive plant at Pudukkotai in Tamil Nadu, is equipped with state-of-the-art Machinery, to meet the growing demand of the INTER-NATIONAL Markets and ample infrastructure for further expansion. 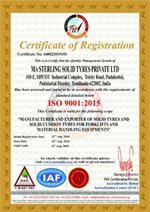 The SOLID tyres that have rolled out of this automated plant have been put to Stringent QUALITY CONTROL norms and have with stood the test of time. 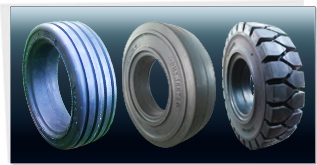 Apart from the wide range of moulds to select from, the plant is designed to cater to specific customer requirements.